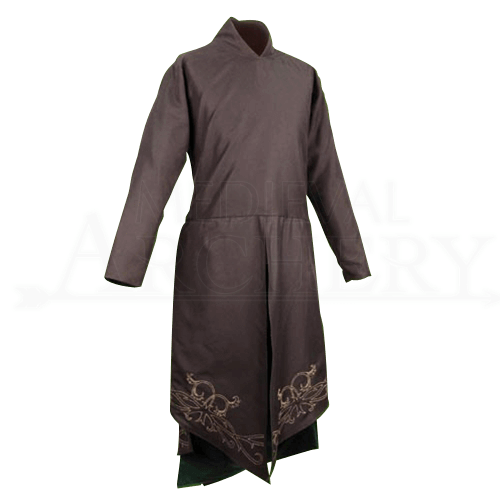 Elves are known for their peerless works in nearly all crafts, and in regards to this Embroidered Elven Tunic, that reputation is firmly upheld, making this a fine garment for any fantasy enthusiast to wear when creating an iconic elven style. Loose and flowing, this long, black tunic is designed with elven style in mind, and it serves well in creating a muted and subdued yet graceful look for all those who would wear it. The tunic features a unique, backed collar with a slanted neckline in the front, while also featuring full-length sleeves. The tunic has a long length and is opened from the waist down to create a graceful sort of flow in the garment, while the edges feature embroidered gold vine and leaf patterns that echo the natural influence often found in elven crafts. The garment laces up the back for a bit of adjustability, and it is made entirely in a comfortable poly-cotton fabric blend. 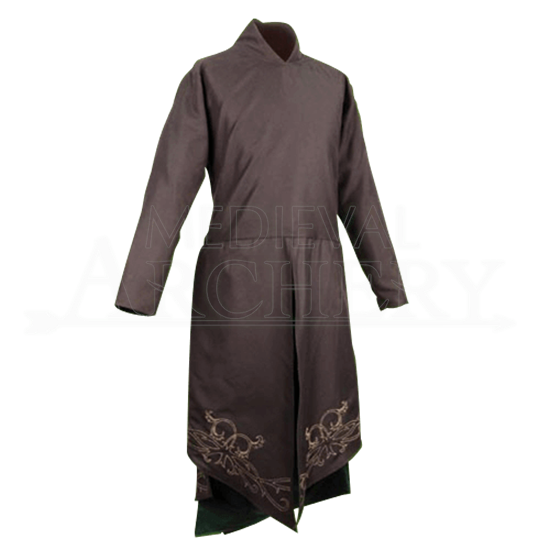 The interior of the tunic is fully lined, in deep forest green material. The coat is offered in two sizes, either Small/Medium or Large/X-Large. A simple pair of black breeches will complete the base of any elven look when you wear this Embroidered Elven Tunic, and in it, you will look more like an elven lord than anything else, making it a great way to show off rich style while also creating your own ideal fantasy look.